Katharine Lee Bates (August 12, 1859 – March 28, 1929) was a prolific American writer, college professor, scholar, and social activist. Although she published volumes of poetry, travel books, essays, children's books, books for young adults, and editions of many earlier writers' works, today Bates is primarily remembered as the author of "America the Beautiful". While on the Wellesley College faculty, Bates mentored many young poets (including some, like Robert Frost, not enrolled at Wellesley) and helped establish American literature as a field for college study by creating an early course on the genre and writing a textbook for the field (the first woman to do the latter). Some late 20th-century scholars have asserted that Bates was a lesbian who live for 25 years with long-time friend and companion Katharine Coman; but Dr. Melinda M. Ponder, author of the definitive full-length biography (Katharine Lee Bates: From Sea to Shining Sea, 2017), has presented conflicting evidence and reached a more nuanced conclusion. Statue of Katharine Lee Bates at the Falmouth Public Library in Falmouth, Massachusetts. Bates was born in Falmouth, Massachusetts to the town's Congregational minister William Bates and Cornelia Frances Lee. Her father died a few weeks after she was born, and she was primarily raised by her mother and a literary aunt, both of whom had graduated from the all-women's Mount Holyoke Seminary. She attended Wellesley High School (then called Needham High School) in 1872 and then Newton High School until 1876. Bates entered Wellesley College, a women's college, as part of its second class in 1876. She graduated with a B.A. in 1880. She taught at Natick High School in 1880–81 and at Dana Hall School from 1881 until 1885. In 1889 Bates's young adult novel Rose and Thorn won a prize awarded by the Congregational Sunday School and Publishing Society. It incorporated poor and working class women as characters to teach readers about social reform. She popularized the concept of Mrs. Claus in her poem "Goody Santa Claus on a Sleigh Ride" from the collection Sunshine and other Verses for Children (1889). The Mrs. Claus character is the chief organizer of Christmas Eve. Taking advantage of new educational opportunities available to women after the Civil War, Bates used prize money from Rose and Thorn to travel to England and study at Oxford University in 1890–91. She then returned to Wellesley as an associate professor in 1891, earned her M.A. there, and was promoted to a full professor of English literature. Near the end of the Spanish-American War, she worked as a war correspondent for The New York Times, and strove to reduce widely-circulating negative stereotypes about Spaniards. She contributed regularly to periodicals (sometimes under the pseudonym James Lincoln), including The Atlantic Monthly, The Congregationalist, Boston Evening Transcript, Christian Century, Contemporary Verse, Lippincott's, and The Delineator. In 1906 Bates and her brother Arthur signed a mortgage for a Wellesley houselot and house (now 7 Curve St.) to be built on it for the Bates family (Cornelia, Jeanne, and Katharine) and their tenants. Among the latter was Katharine Coman, who would eventually rent an attic bedroom and photographic darkroom. While the house was being built, Bates traveled to Egypt and the Holy Land with Wellesley College president Caroline Hazard. Upon returning to Wellesley, Bates named the house "The Scarab," after the sacred Egyptian insect she admired as "always climbing." Bates died in Wellesley, Massachusetts, on March 28, 1929, while listening to a friend read poetry to her. She is buried in Oak Grove Cemetery at Falmouth. Most of her papers are housed at the Wellesley College Archives and include "diaries, correspondences, musical scores, publications, scrapbooks, manuscripts, reports, memorials and tributes, memorabilia; concerning "America the Beautiful" and other writings of Katharine Lee Bates, her travels, and her life at Wellesley and in Falmouth, Mass." Main article: "America the Beautiful"
One day some of the other teachers and I decided to go on a trip to 14,000-foot Pikes Peak. We hired a prairie wagon. Near the top we had to leave the wagon and go the rest of the way on mules. I was very tired. But when I saw the view, I felt great joy. All the wonder of America seemed displayed there, with the sea-like expanse. The hymn has been sung to several tunes, but the familiar one is by Samuel A. Ward (1847–1903), written for his hymn "Materna" (1882). On Thursday, April 4, 2019, the poem, its origins, several different musical renditions, and significance were the subject of a National Public Radio audio story narrated by Eric Westervelt entitled "Greatness Is Not A Given: 'America the Beautiful' Asks How We Can Do Better" (htpps://www.npr.org/709531017). Photo of Katharine Coman, also a professor at Wellesley. 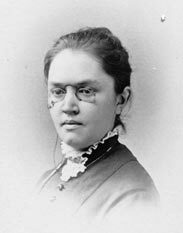 In earlier commentary Judith Schwarz interpreted Bates's letters and poems to Coman as evidence of a lesbian relationship, citing as an example Bates's 1891 letter to Coman: "It was never very possible to leave Wellesley [for good], because so many love-anchors held me there, and it seemed least of all possible when I had just found the long-desired way to your dearest heart... Of course I want to come to you, very much as I want to come to Heaven." And in 1999 historian Lillian Faderman also concluded that the relationship between Bates and Coman was a "lesbian arrangement," including them among the other women faculty at Wellesley who paired off with each other. :196 Other scholars contest the use of the term lesbian to describe what was characterized at the time as a "Boston marriage". Writes one: "We cannot say with certainty what sexual connotations these relationships conveyed. We do know that these relationships were deeply intellectual; they fostered verbal and physical expressions of love." Certainly, Bates long shared rental housing with various Wellesley faculty members, all of whom thereby economized while earning small salaries. Occasionally she traveled with her long-time friend, Katharine Coman. And in 1910, when a colleague described "free-flying spinsters" as "fringe on the garment of life", Bates answered: "I always thought the fringe had the best of it. I don't think I mind not being woven in." Bates's and Coman's connection is perhaps destined to be interpreted differently by different readers forever. The facts remain that Coman and Bates met at Wellesley in 1885 when the president of Wellesley College, Alice Freeman Palmer, determined to add women to the college's faculty. Coman served as a history and political economy professor, and founded the Wellesley College Economics Department. During her lifetime, Coman was nearly as well known as Bates. :61 Both colleagues became influential independent women within their fields during their lifetimes; and Bates's work has continued to influence American life and literature to this day. In the days after Coman's death from breast cancer in 1915, Bates wrote a memorial to Coman, which is thought to be the first American narrative about breast cancer. Bates intended that the manuscript be privately circulated among the women's close circle of friends and family, writing on the title page: "For Katharine Coman's family and innermost circle of friends: Not for print nor in any way for general circulation. ":63 In 1922, Bates published Yellow Clover: A Book of Remembrance, a collection of poems she had addressed to Coman while alive or since her death. She dedicated the volume to Coman, referred to her as "my Friend [sic]", and included as a "Prefatory Note" a three-page biography of Coman largely focused on her career as an economist and historian, but written in a tone personal enough to allow a reference to her "vigorous and adventurous personality" and her "undaunted courage" in continuing to work during her final illness. The Bates family home on Falmouth's Main Street is preserved by the Falmouth Historical Society. There is also a street named in her honor, "Katharine Lee Bates Road" in Falmouth. The "Shining Sea Bike Trail", named in honor of Bates, extends 11 miles from North Falmouth to Woods Hole, passing just a block from the Bates home. A plaque marks the site of the home where she lived as an adult on Centre Street in Newton, Massachusetts. The historic home and birthplace of Bates in Falmouth, was sold to Ruth P. Clark in November 2013 for $1,200,000. The Katharine Lee Bates Elementary School on Elmwood Road in Wellesley, Massachusetts, and the Katharine Lee Bates Elementary School, founded in 1957 in Colorado Springs, Colorado, and Bates Hall dormitory at Wellesley College are named for her. The Katharine Lee Bates Chair in English Composition and Literature was established at Wellesley shortly after her death. Collections of Bates's manuscripts are housed at the Arthur and Elizabeth Schlesinger Library on the History of Women in America, Radcliffe College; Falmouth Historical Society; Houghton Library, Harvard University; Wellesley College Archives. In 2012, she was named by Equality Forum as one of their 31 Icons of the 2015 LGBT History Month. The College Beautiful, and Other Poems, Houghton (Cambridge, Massachusetts), 1887. Rose and Thorn, Congregational Sunday-School and Publishing Society (Boston, MA), 1889. Hermit Island, Lothrop (Boston, MA), 1890. Sunshine, and Other Verses for Children, Wellesley Alumnae (Boston, MA), 1890. The English Religious Drama, Macmillan (New York, NY), 1893, reprinted, Kennikat Press (Port Washington, NY), 1966. American Literature, Chautauqua Press (New York, NY), 1897. Spanish Highways and Byways, Macmillan (New York, NY), 1900. (As James Lincoln) Relishes of Rhyme, Richard G. Badger (Boston,MA), 1903. From Gretna Green to Land's End: A Literary Journey in England, photographs by Katharine Coman, Crowell (New York, NY), 1907. The Story of Chaucer's Canterbury Pilgrims, Rand, McNally (Chicago, IL), 1909. America the Beautiful, and Other Poems, Crowell (New York, NY), 1911. In Sunny Spain with Pilarica and Rafael, Dutton (New York, NY), 1913. Chaucer's Canterbury Pilgrims, Retold by Katharine Lee Bates, illustrated by Angus MacDonall, color plates by Milo Winter, Rand, McNally (Chicago, IL), 1914. Fairy Gold, Dutton, (New York, NY), 1916. The Retinue, and Other Poems, Dutton (New York, NY), 1918. Sigurd Our Golden Collie, and Other Comrades of the Road, Dutton (New York, NY), 1919. Yellow Clover, A Book of Remembrance, Dutton (New York, NY), 1922. Little Robin Stay-Behind, and Other Plays in Verse for Children, Woman's Press (New York, NY), 1923. The Pilgrim Ship, Woman's Press (New York, NY), 1926. America the Dream, Crowell (New York, NY), 1930. An Autobiography, in Brief, of Katharine Lee Bates, Enterprise Press (Falmouth, MA), 1930. Selected Poems of Katharine Lee Bates, edited by Marion Pelton Guild, Houghton Mifflin (Boston, MA), 1930. Browning Studies: Bibliography, Robinson (Boston, MA), 1896. English Drama: A Working Basis, Robinson(Boston, MA), 1896, enlarged as Shakespeare: Selective Bibliography and Biographical Notes, compiled by Bates and Lilla Weed, Wellesley College (Wellesley, MA), 1913. Compiled with Lydia Boker Godfrey. English History Told by English Poets, Macmillan (New York, NY), 1902. Compiled with Katharine Coman. Historic Towns of New England, edited by Lyman P. Powell, Putnam (New York, NY), 1898. The Wedding Day Book, Lothrop (Boston, MA), 1882, published as The Wedding-Day Book, with the Congratulations of the Poets, Lothrop (Boston, MA), 1895. Coleridge's The Rime of the Ancient Mariner|Ancient Mariner, Leach, Shewell & Sanborn (Boston, MA), 1889. Ballad Book, Leach, Shewell & Sanborn (Boston, MA), 1890, reprinted, Books for Libraries Press (Freeport, NY), 1969. Shakespeare's Comedy of The Merchant of Venice, Leach, Shewell & Sanborn (Boston, MA), 1894. Shakespeare's Comedy of A Midsummer Night's Dream, Leach, Shewell & Sanborn (Boston, MA), 1895. Shakespeare's Comedy of As You Like It, Leach, Shewell & Sanborn (Boston, MA), 1896. Stories from the Chap-Book, Stone (Chicago, IL), 1896. Keats's The Eve of St. Agnes, and Other Poems, Silver, Burdett, (New York, NY), 1902. The Works of Nathaniel Hawthorne, fourteen volumes, Crowell (New York, NY), 1902. Hamilton Wright Mabie, Norse Stories Retold from the Eddas, Rand, McNally, Chicago, 1902. The Poems of Alice and Phoebe Cary, Crowell (New York, NY), 1903. John Ruskin, The King of the Golden River; or, the Black Brothers: A Legend of Stiria, illustrated by John C. Johansen, Rand, McNally (Chicago, IL), 1903. Tennyson's The Princess, American Book Co. (New York, NY), 1904. Tennyson's Gareth and Lynette, Lancelot and Elaine, The Passing of Arthur, Sibley (Boston, MA), 1905. The New Irish Drama, Drama League of America (Chicago, IL), 1911. Thomas Heywood, A Woman Killed with Kindness, and the Faire Maide of the West, Heath (Boston, MA), 1917. Once Upon a Time; A Book of Old-Time Fairy Tales, illustrated by Margaret Evans Price, Rand, McNally (Chicago, IL), 1921. Tom Thumb and Other Old-Time Fairy Tales, illustrated by Price, Rand, McNally (Chicago, IL), 1926. Jack the Giant-Killer, Rand, McNally (Chicago, IL), 1937. Jack and the Beanstalk; also Toads and Diamonds, Rand, McNally (Chicago, IL), 1937. Nathaniel Hawthorne, Our Old Home: A Series of English Sketches, Crowell (New York, NY), 1906. Helen Sanborn, Anne of Brittany, Lothrop, Lee & Shepard (Boston, MA), 1917. Helen Corke, The World's Family, Oxford University Press (New York, NY), 1930. Gustavo Adolfo Becquer, Romantic Legends of Spain, Crowell (New York). With Cornelia Frances Bates. ^ a b c d e f g h i j k l m n o p q r s t u v w x y z Ponder, Melinda M. (2017). Katharine Lee Bates: From Sea to Shining Sea. Chicago, Illinois: Windy City Publishers. ISBN 9781941478479. ^ a b c d e f g h i j k Ponder, Melinda M. (2016). "On the trail of Katharine Lee Bates: Talk for the Wellesley Reunion Class of 1966" (PDF). Retrieved July 5, 2018. ^ "Katharine Lee Bates Manuscript Collection" (PDF). Falmouth, Massachusetts: Falmouth Museums on the Green. ^ "New Books". The American Bookseller. American News Company. XXVI (7): 481. October 1, 1889. Retrieved April 17, 2019. ^ "Republican Women Declare for Davis" (PDF). New York Times. October 20, 1924. Retrieved January 6, 2012. ^ Wilson, Scott. Resting Places: The Burial Sites of More Than 14,000 Famous Persons, 3d ed. : 2 (Kindle Locations 2892-2893). McFarland & Company, Inc., Publishers. Kindle Edition. ^ "Katharine Lee Bates". Wellesly College Archives. October 15, 2012. Retrieved July 5, 2018. ^ "A Good Minor Poet" (PDF). New York Times. March 24, 1912. Retrieved January 6, 2012. ^ a b Schwarz, Judith (Spring 1979). ""Yellow Clover": Katharine Lee Bates and Katharine Coman". Frontiers: A Journal of Women Studies. 4 (1): 59–67. doi:10.2307/3346671. JSTOR 3346671. Quote p. 59: Katharine Lee Bates and Katharine Coman were a devoted lesbian couple. ^ Palmieri, Patricia A. (Summer 1983). "Here was fellowship: a social portrait of academic women at Wellesley College". History of Education Quarterly. 23 (2): 195–214. doi:10.2307/368159. JSTOR 368159. Quote, pp. 205. ^ a b c d e Leopold, Ellen (2006). "My soul is among lions: Katharine Lee Bates' account of the illness and death of Katharine Coman". Frontiers: A Journal of Women Studies. 23 (1): 60–73. doi:10.1353/leg.2006.0008. ^ Bates, Katharine Lee (1922). Yellow Clover: A Book of Remembrance. E.P. Dutton. Dedication, acknowledgments (viii), prefatory note (ix–xi). Retrieved April 17, 2019. ^ "Shining Sea Bike Trail". capecodbikebook.com. ^ Hufstader, Louisa. "Sold! Historic Katharine Lee Bates Home". Falmouth Patch. Retrieved 23 December 2013. ^ "Katharine Lee Bates Elementary School in Colorado Springs, CO". d11.org. ^ Chance, Jane (2005). Women Medievalists and the Academy. University of Wisconsin Press. p. 241. ^ "Katahrine Lee Bates biography". LGBT History Month. Retrieved 5 October 2012. Almanac of Famous People, sixth edition, Gale (Detroit, MI), 1998. Dictionary of Literary Biography, Volume 71: American Literary Critics and Scholars, 1880–1900, Gale (Detroit, MI), 1988. Encyclopedia of World Biography, Volume 2, Gale (Detroit, MI), 1998. Gay and Lesbian Literature, St. James Press (Detroit, MI), 1998. Vida Dutton Scudder, On Journey, E.P. Dutton (New York, NY), 1937. Drury, Michael, "Why She Wrote America's Favorite Song," Reader's Digest, July 1993, pp. 90–93. Price, Deb. The Bellingham Herald, July 4, 1998: "Two women's love made 'America' Beautiful". Christian Science Monitor, July 19, 1930. The Dial, January 16, 1912.
International Book Review, June 24, 1924. The Nation, November 30, 1918. New York Times, July 14, 1918; August 17, 1930. Wikimedia Commons has media related to Katharine Lee Bates. Biography and Poetry of Bates, part of a Series poet's biographies. This page was last edited on 18 April 2019, at 00:50 (UTC).